Since its 1990 publication, Rose’s Christmas Cookies has been a phenomenal success. Who can resist Chocolate-Dipped Melting Moments Cookies or moist Mini-Cheesecakes with Lemon Curd . . . or David Shamah’s Jumbles, a fabulous cross between a chocolate-chip cookie and a chunky candy bar bursting with raisins, chocolate chips, and pecans. Whether you need a cookie to decorate your tree or grace your mantelpiece (cookies like Stained Glass or Christmas Wreaths), a sweet to send (Mahogany Butter Crunch Toffee, Maple Macadamia Bars), or a special holiday treat for your dinner party (Praline Truffle Cups, Chocolate-Pistachio Marzipan Spirals), you’ll find that perfect something here. Complete with 60 cookie recipes and a color photograph of each cookie for handy reference, this easy-to-use and fun-to-read book will result in scrumptious, festive, and splendid-looking cookies every time. Rose’s first book, The Cake Bible, was the 1988 winner of the IACP/Seagram Book of the Year and the NASFT Showcase Award for the cookbook that has contributed most to educating the consumer about specialty foods. A culinary best-seller, The Cake Bible is currently in its 45nd printing. 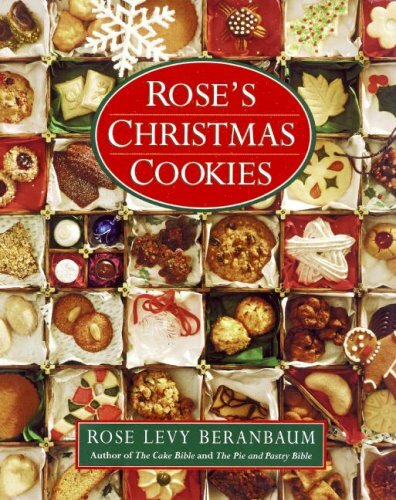 Rose’s Christmas Cookies, was the 1990 winner of the James Beard Best Book in the Dessert and Baking Category. The Pie and Pastry Bible, published in 1998, received many kudos including: Food & Wine Books “Best of the Best: The Best Recipes from the Best Cookbooks of the Year” and Coffee & Cuisine “Best Cookbook” award. Rose’s comprehensive book, The Bread Bible, was the 2003 winner of the Gourmand World Cookbook Awards in the Best Bread Book Category. It was listed by Publisher’s Weekly and Food & Wine as one of the top ten books of 2003, and by Fine Cooking as one of the top 12. From quick breads, such as muffins, biscuits, and scones, to yeast breads, such as seeded wheat breads, Jewish rye, baguette, and brioche, this is a collection of her favorites, with innovative techniques that will guarantee making a successful bread baker of anyone who so desires. Rose’s newest book, Rose’s Heavenly Cakes, is a return to cakes with a comprehensive four color book for Pam Chirls, Senior Editor at Wiley. She also has a product line, Rose Levy Bakeware, and has produced Rose’s Heavenly Cake Strip, a silicone halo that produces more even layer cakes, both distributed by Harold Imports. An internationally known food expert, Rose also has been a featured presenter in the highly regarded Melbourne Food & Wine Festival and the Oxford Food Symposium.